Personal Injury Lawyers, Herring & Herring, P.A. Florida is one of the leading states in the U.S. for auto accidents. Auto accidents are usually caused by one driver’s negligence and often result in injury and even sometimes deaths. Although tragic, many of these auto accidents are unavoidable. When dealing with the medical, financial and mental difficulties of a serious auto accident you always want to have experienced and aggressive attorneys by your side. Insurance adjusters deal with these situations every day and are trained at preventing you from getting the compensation you deserve. At Herring & Herring Law, we are experienced in dealing with auto accidents and negotiating your claim with Insurance carriers. We zealously represent your rights and will not settle for anything less than the full compensation you are owed. Don’t be fooled by the deceit, threats, and coercive tactics insurance adjusters use in order to limit your claim. It is critical that you have the right attorneys on your side. Inexperience and lack of resources could cost you. 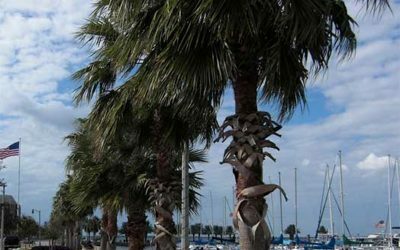 At Herring & Herring, we have the experience in the state of Florida. Our team has the resources, experience, passion and drive to win even the most difficult auto accident cases. We care about our clients and provide a client experience second to none in the state of Florida. We will fight to get the largest recovery possible by law. Our history of representing auto accident clients is stellar and reflects our dedication and knowledge of our passion for helping injured auto accident victims. Individuals that have been injured in any type of automobile accident, including hit and run accidents is eligible to seek compensation from negligent drivers. It is important to know that negligent drivers need to held accountable for their actions. Injured parties have every right to peruse fair compensation including loss of income and medical expenses because of another person or party’s actions. When you contact Herring and Herring our qualified injury attorneys that specialize in auto accidents will provide review your case and get you on the right path to protect your rights and recover damages on your behalf. 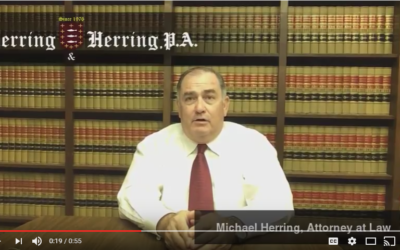 Contacting Herring & Herring is one of the smartest choices you will make when it comes to legal representation in Florida. With our vast knowledge of auto accidents, our legal team will investigate your auto accident case. Gathering information from you, investigating the scene, vehicles involved, police reports and any and all evidence that may have come into play regarding your accident. We will stand up to insurance companies and or any other parties that may have caused you harm through no fault of your own. We will protect you and your rights the entire time. When you are injured in an accident in the state of Florida you have limited time in which you must make a claim for damages. If you or a family member suffered an injury in an auto accident and want to obtain compensation your time is limited. Contact Herring & Herring law today for a free auto accident consultation we can help. You may be entitled to make a claim for lost wages, medical expenses, as well as pain and suffering. We will discuss your case and provide you with what will need to be done with your particular case. Auto accidents in Florida are among one of the leading causes of injury and death. Having a car accident lawyer on your side protecting you and your rights is essential. We have the experience, and understand and know how all the laws in Florida translate to auto accidents. Get legal representation and protect your rights! We’ve seen it time and time again when an auto accident victim is injured and gets incorrect information and moves on decisions based on that incorrect information that negatively affects the outcome of their auto accident lawsuit. Every decision you make must be right. Auto accident victims don’t have second changes on these important decisions. Insurance companies and agents don not have your best interests at heart. Many insurance companies will utilize any means available to them to deny your car accident claim. Unfortunately, many accident victims fall prey to these tactics and are left with a lifetime of regret. 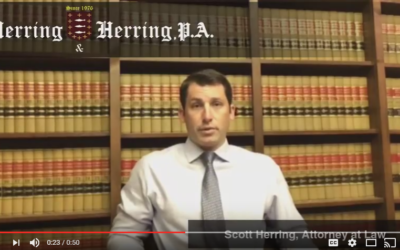 Herring & Herring auto accident attorneys have represented countless car accident victims over the three decades practicing law in the state of Florida. We have the experience and know how to get the maximum compensation for our client’s injuries. Our clients have positive verdicts and settlements and we do it efficiently and quickly. Smart auto accident victims hire experienced attorneys to call us today so we can help you make the right choices. Get medical attention and make sure you inform doctors about your accident, and any pain you may be having. Make sure a police report is filed regarding your accident. Gather insurance information from any other drivers, license plate numbers, as well as driver’s license numbers. Ask for any witness’s names and contact information. Take pictures of the accident scene and any other pertinent information. Pictures often times can be a very valuable resource later. Don’t speak with insurance adjusters or anyone other than your lawyer and doctor about your injuries or the accident. CALL US at 407-323-6700 today to schedule a FREE consultation. You must have suffered an injury. It needs to be determined whether your injury was someone else’s fault. It is important to remember that not all injuries are physical injuries to bring a personal injury case. In some cases, injuries can be based on non-physical losses and harms. Some cases may involve an attack on a reputation or may have invaded your privacy, or inflicted emotional distress upon you. If you so much as think you have a case, contact our office, case consultations are free! It is understandable that injured people want to settle matters quickly and move on their lives. Many people are tempted to take care of issues themselves. You need to know that having a personal injury lawyer on your side is crucial. In virtually all cases, an attorney will work on your case to ensure your recovery is the maximum amount allowable by Florida law. Insurance companies have lawyers representing their negligent party. It is critical you seek a lawyer for your personal injury case, large or small. We get this question a lot and it is to be expected. You must understand that every personal injury case is different and it is impossible to generalize about the value of any case without knowing the full details of the harm caused and the manner it was caused. We can tell you that at Herring & Herring, P.A. we will leave no stone unturned when it comes to detailing all possible losses and will translate them all into a legal recovery. Call our office to speak with an attorney now and we can better help you fully understand your case and the possible recovery. Most personal injury cases that are well prepared will settle for a reasonable compensation before they are presented to a jury. However, in some cases, they may need to be tried before a jury. Typically, these cases involve questions regarding liability or fault and many times questioning whether claimed medical issues were caused by a particular incident. At Herring & Herring, P.A. we are experienced in presenting cases for settlement or at a trial. At Herring & Herring, P.A. we help injured victims recover compensation for personal injuries. We have handled cases resulting from many different circumstances in central Florida. If you or a loved one has been injured in the state of Florida, we welcome the opportunity to provide you legal representation. We are compassionate to all our clients, but understand it takes an aggressive legal team to win — we win personal injury claims for our injured clients. Contact us using our online form or call us at (407) 323-6700 to speak with us directly.